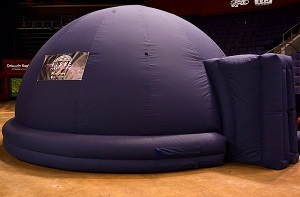 Step inside our inflatable planetarium to take a virtual trip through the universe! Which planets are visible in your local night sky? After seeing which ones can be viewed currently from Earth, we'll tour the solar system and get a close-up view of our neighboring worlds. For ages 7 and up. Shows begin every fifteen minutes.